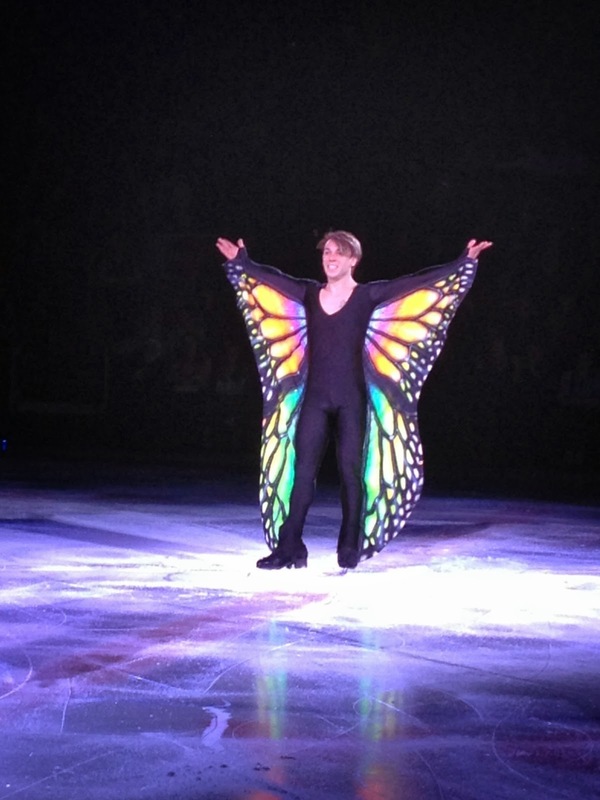 Q: The first time I saw you skate was on Toller Cranston's special in the 90's. You were only young but it was very apparent that you had something VERY special. How did your skating attract Toller's attention and what has your friendship been like over the years? A: As Toller said, he discovered me but as a young skater I had no clue who he was so in a way we discovered each other! We did not spend much time together prior, during and after the show but we connected on such a level that whether we spend time together or not it would not change our strange relationship. I say strange because after the show everyone pointed out our resemblance and decided he was my real father. I was OK with that! I have learned a lot from the few words that he carefully mentioned to me... but those are secret! A: My three favourite skaters of all time are of course Toller Cranston, Kurt Browning and Michelle Kwan. I don't think I need to explain that answer! Q: You have won the Canadian Novice and Junior men's titles and four Senior medals at the Canadian National Championships from 2005 to 2011. What do you consider your proudest moments in your competitive career? A: My proudest moments in competition as a 4 time Senior National Medallist are my qualification to the Olympic Games and my farewell season of 2011 with my own crazy creation of the "Alice In Wonderland"/Mad Hatter long program. I was not much of an exciting competitor. I always did my job, looked focused and prepared but inside I just wanted to perform on a professional level. My Mad Hatter program was the perfect balance that I needed to meet my own criteria and those of the judging system. Q: I know you are very busy with coaching, choreography and performing and I can't imagine you have a ton of free time! What do you most enjoy doing most when you have a little time to yourself? A: In my spare time, what I most enjoy is walking my Chinese crested dog and getting home to a nice glass of red wine. 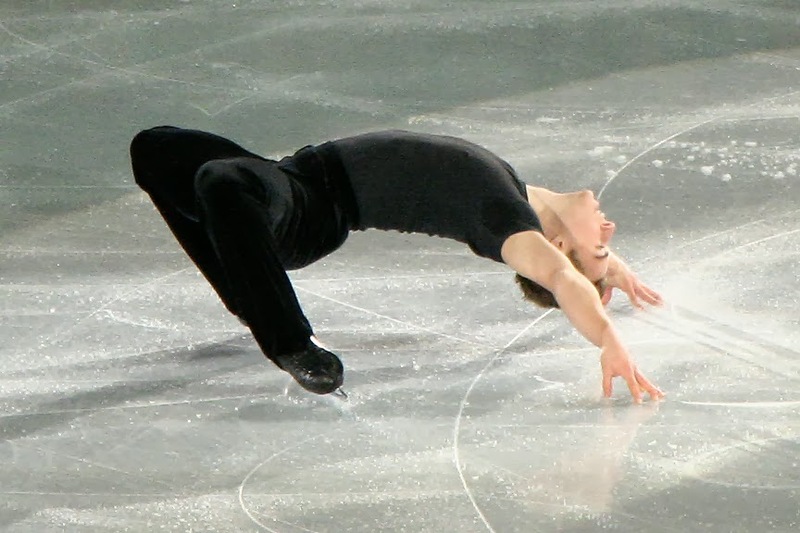 Q: Between your Cantilever, backflip, spins and spirals, you're one of the most exciting skaters to watch! Are all of the flexible "tricks" like the backflip and Cantilever that you use to highlight your programs as scary as they look? A: I include a lot of difficulty and risk to my performances with my many unique tricks. Yes, they are very hard and I do need to keep in perfect shape to perform them to my standards. I am very flexible but to this day I still stretch religiously every day. The backflip is SO much fun and I love the international response that i get from it. The Cantilever will be the number one reason if you see me in a wheelchair before my 30's. I like to innovate, transform and customize skating moves. Spins, jumps and field moves are a perfect way to showcase every skaters unique way of performing them. I just decided to bring them to a high risk level. Q: Where is the most interesting place in the world you have visited and what is one place you haven't that you'd love to go? A: The most interesting place I have visited is Puerto Rico. It was SO nice - warm and perfect! I really want to visit Australia, not only for the country but mostly for the never ending plane ride. I love flying! 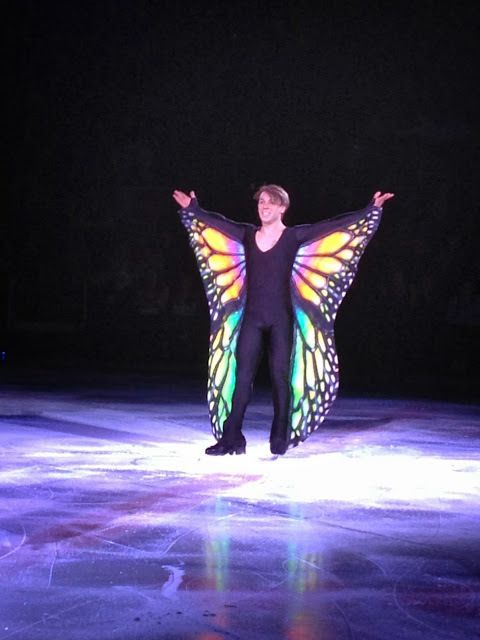 Q: For starters, I just LOVE your skating and I adore your "Alegria" program... as well as the "Carmina Burana" butterfly program and the White Stripes programs you skated at this year's Stars On Ice here in Halifax. I was in the front row here my mother and we both just loved both program! Where do you get your ideas for your programs, how do you put together choreography and what are some of your craziest program ideas that you haven't skated to just yet? A: When it comes to my concepts for my programs, it is very easy. I get ideas all the time, all day long. I let them flourish in my head and decide to try it or discard it. For every program you see me do, there are about ten programs that are discarded. I do take a monstrous amount of time preparing for them, but once I lay it down on the ice I feel confident and ready to show my new baby! I love to come up with new stuff all the time and skating allows me to create more and more ways to reinvent myself and my skating. Q: Who are your three favourite singers and why? A: My top three favourite singers are... number one... Amy Winehouse. Love every single note that came out of her fragile frame. Second, Lady Gaga, because like me she is nuts! Thirdly, Marilyn Manson... Shocking, extravagant and questionable. A: One thing people don't know about me is that I quit skating five minutes before each performance! I get really really, really stressed and I just want to kick my skates off and drive back home as soon as possible... but once I am on the ice I am the happiest person in the world! Q: What are your plans for the upcoming year? Will we will see you back in Stars On Ice and other shows? A: My plan for the upcoming season is to perform as much as possible! I hope to create new concepts and enjoy the time with my dog and my red wine!